Two bird flu patients are being treated in Egyptian hospitals, Egypt's Health Minister Adel Adawi said in a press statement on Tuesday. 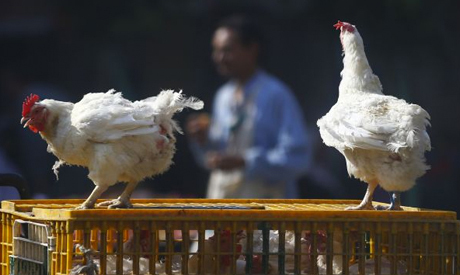 Eight people have died of bird flu in Egypt in 2014, including one person this week in Upper Egypt. The minister also said that there have been 190 H5N1 infections in Egypt since 2006, leading to 71 deaths. "Egypt remains one of the countries with the least deaths resulting from bird flu worldwide, at a 37.4 percent fatality rate," he said, adding that the majority of human infections were contracted by Egyptians who were in direct contact with infected poultry. Most cases of bird flu have been identified in rural areas, where villagers tend to raise poultry in their homes. At least 16 H5N1 infections have been identified by Egypt’s health ministry this year, according to the latest official figures, prompting the ministry to take preventative measures to combat the disease’s spread. Adawi reiterated assurances that the anti-viral medication used to treat bird flu, Tamiflu, is available at public hospitals across Egypt. The death toll from bird flu in Egypt in 2014 has reached eight. H5N1 was first reported in Hong Kong in 1997. It then spread in 2003 and 2004 from Asia to countries all over the world, killing hundreds. Earlier this month six people died in a measles outbreak in Siwa in western Egypt.